The Founding Fathers of America started to celebrate the July 4th Declaration of Independence Day in 1776 as established by Freemasons notably George Washington, Thomas Jefferson, Benjamin Franklin, and other astrologers-masons who planned and designed the national capital region area. 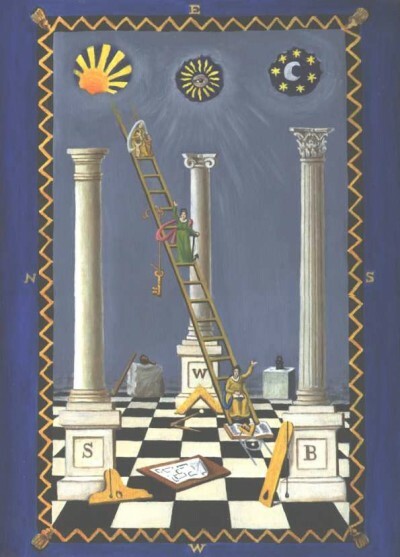 From the ancient concept of “as above so below”, they built the structures aligned to heavenly bodies and star maps particularly the heliacal rising of star Sirius at a certain time of the year. Sirius known as sothis among the Egyptian, Al Shaira as indicated in the Koran, Surya in Sanskrit; T’an Lang or heavenly wolf of the Chinese Purple Star group, is the brightest star in the sky twenty times brighter than our present sun and is located in the constellation Canis Major. Canis Major is the larger of two dogs which follow Orion, the Hunter, at exact alignment on the belt of its 3 stars; faces the 5 stars of Taurus, Hyades, the Bull; and the 7 stars of the Pleiades. Sirius is more visible on the easterly sky of the winter solstice rising after sunset. By the ancient Egyptians, Sirius was revered as the Nile Star, or Star of Isis. Its annual appearance just before dawn at the June 21 solstice, heralded the coming rise of the Nile, upon which Egyptian agriculture depended. This particular heliacal rising is referred to in many temple inscriptions, wherein the star is known as the Divine Sepat, identified as the soul of Isis. 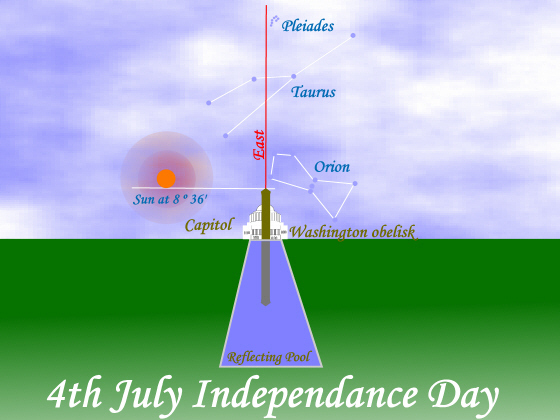 The Fourth of July Declaration of Independence was linked to the brightest star in the heavens, Sirius. Every year on July 4 after sunrise from our earth’s position, our present sun is in conjunction with Sirius. Esoterically this star is the Mason’s Blazing Star when conjoining with the sun and align with the stars in Hyades and Pleiades on a certain period of the ages caused by the precession of the equinox. This alignment is associated with liberation, the concept of freedom, spirituality in human consciousness, enlightenment with God because of the lights coming from this star system. For more esoteric explanation, Sirius, a fixed star located in 13 degrees Cancer is traveling one degree per 72 years and presently on the gateway of the soul journey. From the 25th Degree of the morals and Dogma by Albert Pike “ the constellation Cancer and its counterpart Capricornus held the positions of the Sun at the solstices. When the stars of Cancer marked the position of the Sun at the June solstice, this key station marked the gateway for the descent of souls into incarnation. Cancer was known as the ‘Gate of Man’ through which souls descended from heaven into human bodies. “The Galaxy, Macrobius says, crosses the Zodiac in two opposite points, Cancer and Capricorn, the tropical points in the sun’s course, ordinarily called the Gates of the Sun. These two tropics, before his time [Aries], corresponded with those constellations, but in his day [Pisces] with Gemini and Sagittarius, in consequence of the precession of the equinoxes; but the signs of the Zodiac remained unchanged; and the Milky Way crossed at the signs Cancer and Capricorn, though not at those constellations. “Through these gates, souls were supposed to descend to earth and re-ascend to Heaven. One, Macrobius says, in his dream of Scipio, was styled the Gate of Men; and the other, the Gate of the Gods. Cancer was the former because souls descended by it to the earth, and Capricorn the latter, because by it they re-ascended to their seats of immortality and became Gods. Accdg to Herschel, on the Fourth of July, when the Sun has reached the altitude of the tip of the obelisk at exactly 8º 36’, the Sun, the Capitol Building, and Jefferson Memorial will align within a precision of less than 1 degree if standing at the foot of the Reflecting Pool. The obelisk is a Sun token and represented the Sun god Ra in ancient Egypt. Since the Egyptians worshipped the sacred River Nile representing the Milky Way, the water causeway in front of the obelisk is highly symbolic! 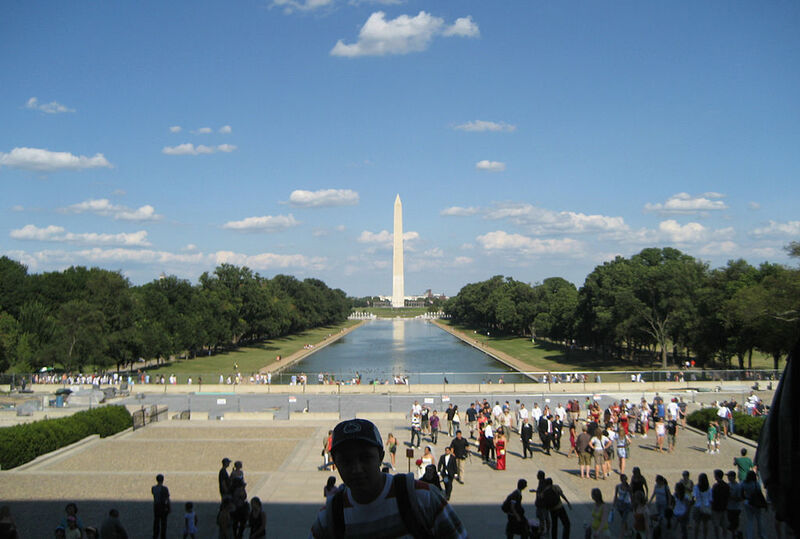 The water causeway at Washington Memorial is called the Reflecting Pool. 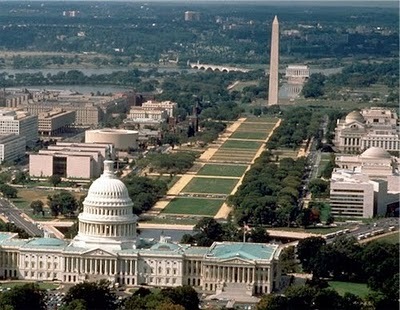 It serves as a diffusing body of water that reflect the Lights coming from the alignment of the stars and planets in the east ( the Sun, Sirius, Taurus and Pleiades) to the capitol building and the surrounding structures. It is also during this day, the head of state and other framers of the government receive the cosmic energy emitted by these stars and planets. On July 4, 1946, the Philippines was granted independence by America. 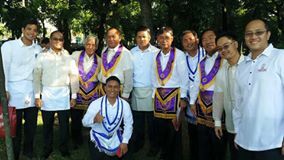 The American forefather masons understand the importance of July 4th astrological symbolism and the effect of its ceremonies but did not impart the meaning to the profane leaving only to selected few Philippine Freemasons particularly Bros Pres Manuel L Quezon and Manuel A. Roxas. The American Brothers entrusted the secret of the heliacal rising of star Sirius on the summer solstice at 13 degrees Cancer, specifically that the Philippines is geographically located within 5 degrees to 19.5 degrees north latitude (tropic of cancer 23.5 degrees ) of the earth facing the rising sun. Some writers accounted the 120 degrees longitude pointing the Philippines as the stargate of the hexagram tetrahedron of the earth map. The change of June 12th Independence was made under the proclamation in 1962 by President Diosdado Macapagal, a non-mason who had no idea about the esoteric side of life existence as taught by the ancient Egyptian Pharaoh to Moses, and whose program of government was focused on nationalism and sovereignty of the country only. June 12th under the Gemini air sign attributes to duality, communications, and travels, energetic, clever, witty, adaptable. superficial, impulsive, restless, devious, indecisive. “Cancer, on the other hand, is a water sign: love home-life, family, and domestic settings. They are traditionalists and enjoy operating on a fundamental level. Bearing the sign of the Crab, Cancerians are legendary for their emotional sensitivity and homely nature. Sometimes though, Cancer’s glyph, or symbol, may represent the breasts as a symbol of the nurturing qualities of the sign. The Crab signifies many traits which are inherent to most natives of Cancer and the one of the most significant of these is a deep love for home and family. Like Crab, a creature which is happy to lug around its house on its back, natives of this zodiac display a strong attachment to home and homely interests. Thus male Cancerians love presiding over large family dinners and having the whole clan come over for family celebrations like Thanksgiving or Christmas. While waiting for VP Binay and Mayor Erap Estrada to arrive for the delayed 8am ceremony (we assembled at GLP at 5:30am and subsequently went to Luneta Park for the 7am schedule of flag raising ), the lag time has kept me contemplate on what will happen to the future of this country? Observing from media the ongoing political intramurals among the aspirants, with the current propaganda advertisement, demolition strategies, and maneuvering, the candidates seem shown no sincere concern for the citizenry. The slogan of helping the people alleviate from poverty and managing the country to successful prosperity with selfless concern is just a promise of a typical traditional politician- very effective political rhetoric for the last 70 years. Enriching oneself in public office is a common practice of an unworthy public servant. Where are the esoteric teachings of the ancient Lemurians? Except for the ancient eight-pointed star of Shamash and Sumeria, or the eight-rayed sun Surya of the Majapahit Empire where the 8 rayed sun on our national flag was unconsciously patterned, the high level of enlightenment which the islanders possess has lost its secret doctrine because of materialism, greed and selfishness, and abuse of power. 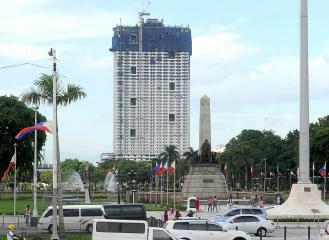 Looking at the eastern sky, I have noticed the under construction condominium Torre de Manila, the controversial structure arising from the once famous Jai Alai gaming building – now blocking the Cosmic Rays of the Rising Sun and the Star Sirius during conjunction every July 4th of the year. These Rays of Light radiate the Obelisk on the Rizal Monument the same orientation as in Washington DC Monument of America. With the structure blocking the cosmic rays and the energy of enlightenment, chaos is imminent to attain order. This is the nature’s law of the universe..Ordo ab Chao. However, there are still upright and enlightened masons who will run this country in the future as imprinted on their fate of destiny. Still, Our Hope Is In God! This was brilliant. I hadn’t gambled on the meaning behind the Cancer and Capricorn tropics as the Gates.